Everyone wants to have their home or business looking its best. Dirt, prints, outside elements, and particles within can serve as a barrier from enjoying the beautiful Colorado scenery. 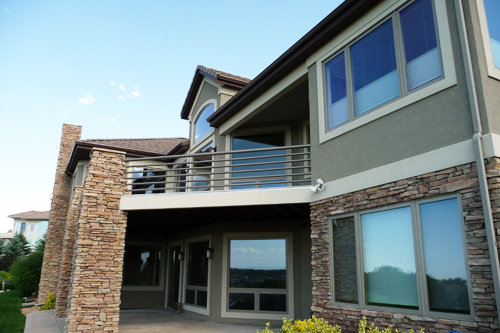 ​Life is busy and it’s hard to find the time or energy to keep your windows looking their best. No need to worry, that’s why we’re here. Rallo’s Window Cleaning, Ltd. offers a multitude of services to meet your needs. Inside and Out - Why spend your weekend tackling your windows when you can be having fun? You'll feel more comfortable in your home after your glass is professionally cleaned, allowing more natural light in. Also, you'll have crisp views of the outdoors! A lot of people ask us the question: "did you forget to put the screens back in the windows?" "No, they are back in." We can also replace torn fabric on most screens. One less thing that you’ll have to worry about cleaning. A clean track will ensure proper window function. This is complementary! All those small panes can seem like a daunting task. No need for you to worry, we’ll take care of it with the proper tools. Out of sight, out of mind... Preventative maintenance is the most efficient way to prolong the life of your gutters, roof, windows and siding. Save money on big repairs. Enjoy the full spectrum of light with RWC’s skylight cleaning service. We clean both outside and inside if needed. Really, who likes doing this? We’ll get into those tough-to-reach places so you don’t have to, both inside and out. We safely clean your panels with Pure Water & soft bristles to gently rinse the dirt away. Some have enjoyed an increase of 30% power output after a proper cleaning!! Rallo’s Window Cleaning can replace out-of-reach bulbs so you won’t have to. You provide us with the bulbs and we’ll do the hard part of putting them in for you. New construction can leave things dirty and dingy. We can help your new business get off on the right foot. We also work with builders to help them get their glass and frame's cleaned up. Finger prints and food particles can build up over time causing bacterial growth. Let us help sanitize your freezer doors to keep ingredients fresh and your customers happy. Have a lot of dirt and cobwebs around your home? Why not have it all washed down? It will brighten up your home and you'll be happy with its appearance!! !